“I have always struggled with my weight, even as a child. After many failed attempts to get my weight under control, I decided to take one more chance and try the Hcg Diet. I started the Hcg Diet on April 28, 2010 at the suggestion and encouragement of my friend, Rashelle Fox with Innovative Health and Wellness and Neil Gladstone, M.D. I noticed a difference in this “diet” almost immediately! I had more energy and no longer felt the need to sleep all the time. The care and encouragement that I have received from Innovative Health and Wellness and Dr.Gladstone have been phenomenal!!! 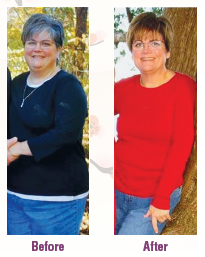 This particular program is not only a weight loss program, but a life changing program. I have learned (so far) a different way of choosing the things I eat and actually look forward to EXERCISE! an overall loss of 38 inches and dropped from a size 18-20 to a size 10!